Scoring almost maximum points for quality and value, the GS1 is a package that's hard to beat. Well made with top-notch features; all branded components. At the price, pretty much nothing. Gretsch's G Series is a new range of entry level kits replacing the company's highly successful Blackhawk Series. Launched at this year's NAMM, G Series kits are made at one of Gretsch's dedicated facilities in Taiwan. The G Series contains two levels of specification with separate price-points; the review GS1 kit is the standard package, while the slightly more expensive GS2 kits have a few extra components and options thrown in. All versions of the kit include a set of Sabian SBR cymbals and a Gibraltar 4000 series hardware pack. "The toms are surprisingly clear and rich sounding and would give many a more expensive set of drums a run for their money." 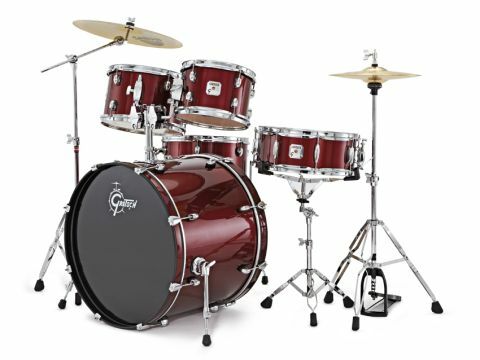 Across the G Series the drums are built from 7-ply poplar and mahogany shells, cross-laminated with the inner ply running vertically. Both woods have been used in drum making for decades, with mahogany being held in particularly high esteem. As well as providing a better quality shell at this price than before, Gretsch has also cut the bearing edges at 30°, again a first at this level. The GS1 is available in a single configuration, which is 22"x16" bass drum, 14"x5½" snare, 10"x7" and 12"x8" toms and a 14"x14" floor tom. Coupled with the contemporary diameters, Gretsch has also opted for shallow tom depths. Practicality has partly influenced this decision, because they are easier to mount within reach of younger players, but the appearance and performance characteristics of such dimensions also played a part. Two choices of wrap finish are available - Dark Red Metallic (as reviewed) and Liquid Black. The Gibraltar hardware pack consists of a snare stand, hi-hat stand, boom cymbal stand and bass drum pedal. Stands are double braced while the pedal boards sport a wave design reminiscent of Gibraltar's sculpted Avenger and Prowler pedal boards. The SBR cymbal pack is limited to a pair of 13" hi-hats and an 18" crash/ride, but they are real Canada-manufactured Sabians and bear a healthy complexion of hammer marks and lathing grooves. We took the kit to a two-hour rehearsal with an aggressive punk band. Everything stayed in place and very little retuning was required. The bass drum has just a single dampening ring on its batter head so requires a little extra dampening to control. The drum soon calms down and produces a solid, punchy note. Its response is quick but it tunes low enough to give a darkish slap while still projecting well out front; more expensive heads would only improve it further. The toms are surprisingly clear and rich sounding and would give many a more expensive set of drums a run for their money. The short lengths of the rack toms make for tuning ease, plenty of attack and rapid, uncluttered decay. Some of this speed and urgency is present in the floor tom, along with an added depth and longer fade. The snare is also capable of generating serious amounts of volume. It is most at home in higher tunings, where it cuts through with a bright, crisp note. While happy slamming out backbeats, it also responds well to gentler promptings; light sticking is rewarded with buzzing wires right into the edges and cross-sticking elicits a sharp 'tap'. While the Sabian SBR cymbals are brass not bronze, they're many times more refined than the unbranded cymbals often found at this level. The 13" hats are particularly sweet-sounding. Similarly the 18" crash/ride contains very little tell tale toppiness, executing its two disciplines with an air of polished ease.